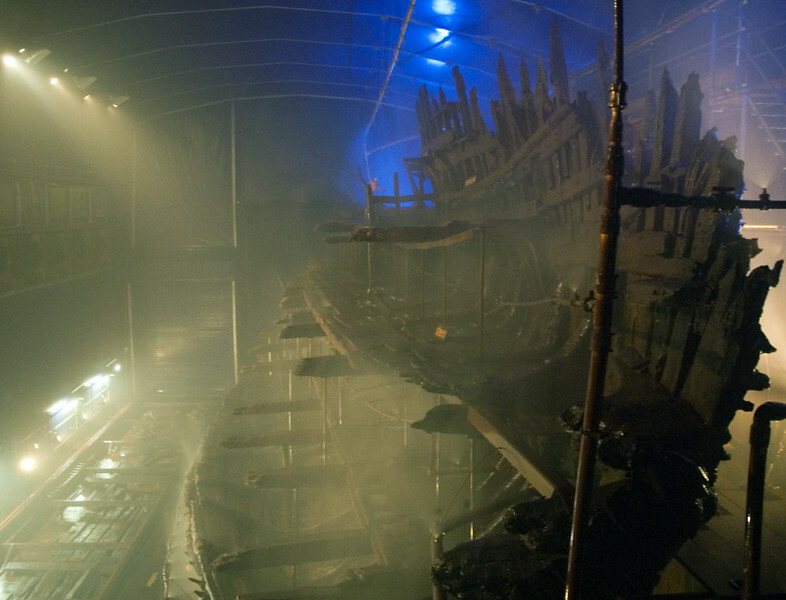 13 photos of this Tudor warship taken in 2007 and 2013. Mary Rose was launched in 1511 and sank off Portsmouth in 1545 during the Battle of the Solent when the French attempted to invade England. The reasons for the sinking are uncertain. About one third of the hull survived because it was buried by sediments. It was recovered in 1982. Since then the hull and many artefacts have been on display at Portsmouth, where they have been undergoing a prolonged conservation process which, in 2013, was approaching completion. Mary Rose, Portsmouth, 6 March 2007 1. Here are seven views of Mary Rose in 2007. This view looks forward from the stern. Only part of the starboard side of the hull has survived. At the time of my visit, it was being saturated with polyethylene glycol to strengthen the timbers. This process continued for a number of years. Earlier, it had been sprayed with fresh water to wash out the salts, also for several years. After recovery in 1982, the hull was placed in No 3 drydock, where it remains.